This past weekend a mermaid was seen bathing and soaking up the sun on the beautiful beaches of Sydney. There's been numerous reports of the mermaid sighting both on Sydney Harbour, as well as swimming down to beaches Bondi Beach, Maroubra Beach and Malabar. 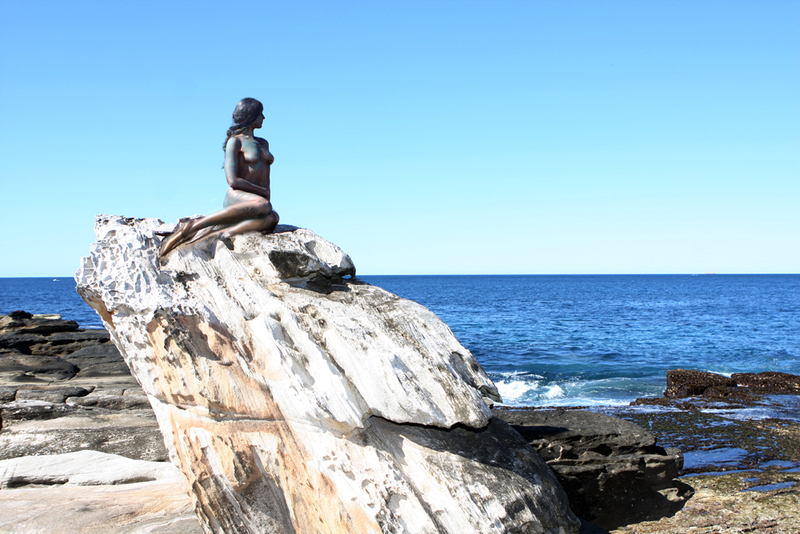 Australian media agencies confirm that they have started to received photo sets of images of a mermaid swimming, bathing and sunning herself, and experts advise that the photos were taken at Bondi Beach and / or Maroubra Beach, with local fishermen swearing they saw her swimming southward from Sydney Harbour. An anonymous tip-off says that the Mermaid promotion is likely part of a paid tourism related campaign relating to a European tie in with the iconic Sydney Opera House of all places. One media commentator pinpoints the campaign originating from Denmark. Rumours continue to swirl around as to how many companies and individuals are involved in this campaign that appears to have the look of a publicity stunt. Mermaid: A mermaid is a legendary aquatic creature with the upper body of a female human and the tail of a fish. Mermaids appear in the folklore of many cultures worldwide, including the Near East, Europe, Africa and Asia. The first stories appeared in ancient Assyria, in which the goddess Atargatis transformed herself into a mermaid out of shame for accidentally killing her human lover. Mermaids are sometimes associated with perilous events such as floods, storms, shipwrecks and drownings. In other folk traditions (or sometimes within the same tradition), they can be benevolent or beneficent, bestowing boons or falling in love with humans. Mermaids are associated with the mythological Greek sirens as well as with sirenia, a biological order comprising dugongs and manatees. Some of the historical sightings by sailors may have been misunderstood encounters with these aquatic mammals. Christopher Columbus reported seeing mermaids while exploring the Caribbean, and sightings have been reported in the 20th and 21st centuries in Canada, Israel and Zimbabwe. The U.S. National Ocean Service stated in 2012 that no evidence of mermaids has ever been found. Mermaids have been a popular subject of art and literature in recent centuries, such as in Hans Christian Andersen's well-known fairy tale "The Little Mermaid" (1836). They have subsequently been depicted in operas, paintings, books, films and comics.